To everything there is a season. This is true on any farm, and an alpaca farm is no different. 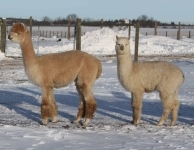 On our farm we deal primarily with farm start ups and newcomers to alpaca farming. 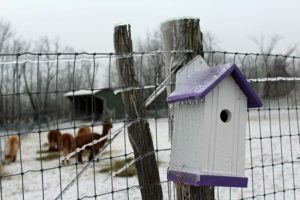 Two of the key questions we get from newcomers, and even journalists that visit the farm, is what happens to the alpacas in winter, and what do you do to get ready for winter on the farm? It’s a struggle to get to the barn when a heavy snow hits. 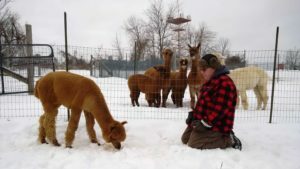 In 8 years of raising alpacas here on the Oak Hills in Ontario, we have learned a lot about winter, both through trial and error, and by gleaning wisdom from the many mentors that have shared their wisdom through the years. And the learning never ends. If you have a great winter trick to share with others, consider Tweeting it out and sharing it by tagging us (OHalpacas). We will be sure to share the knowledge. One of the things we enjoy most about farming is how aware it makes us of each season. It’s hard to decide which season we look forward to most. Each one brings exciting milestones. But winter is a really special season on the farm that needs special preparation. 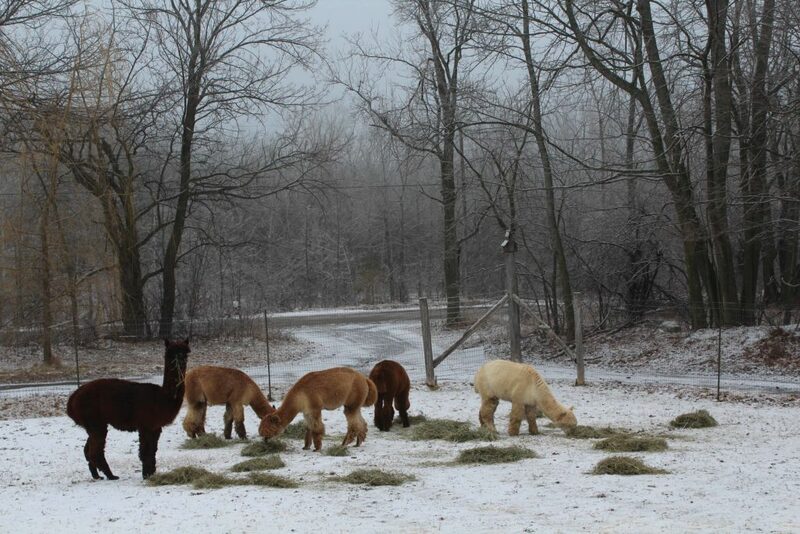 What makes winter so special on an alpaca farm is the peace that it brings. There’s a stillness that comes with winter that makes you pause and relax. You have to relax, because once winter arrives, what’s done is done. The hay mow is full, all the girls are bred, the fibre is off to the mill and you have settled your herd into their pastures for winter. All the work is done. It’s time to relax and take it all in. 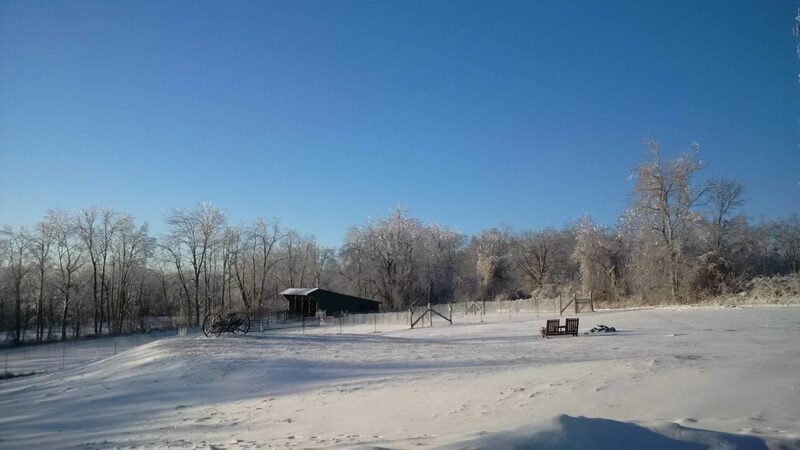 When an ice storm hits the farm, even getting to the barn can be treacherous. It takes more energy just to get to the barn in the depths of winter, with snow up to your knees, ice under that snow, and wind and snow blowing in your face as you make your way there. But when you get there, there’s nothing like a barn full of alpacas quietly humming to one another while you watch and listen. I don’t think I really experienced the concept of “peace on earth” until I built a barn, filled it with alpacas, and then stood amongst them on a winter’s day. The hum of the alpacas will lull you into that peace. When you wake yourself back to reality and look around, it’s also a time to appreciate all that you have accomplished in the past year. I look around and appreciate the full grain bin and the hay bales stacked to the roof. The smell is sweet, and the feeling is great knowing that your herd is going to have what it needs to get through the long winter. I stand and stare at the girls in their stall and imagine what each of them will produce in spring when their cria hit the ground. And I watch the little ones that arrived this season, as they grow and play, marveling at what each match we made has produced and laughing as I watch them experience snow and ice for the first time. There’s a real sense of satisfaction on those quiet winter days when you slow down and take time to admire what the year has produced. The only way to enjoy this sense of satisfaction is to adequately prepare for winter. Here’s how we do it at Oak Hills. 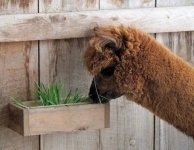 Heated pails are used to water the alpacas in winter. 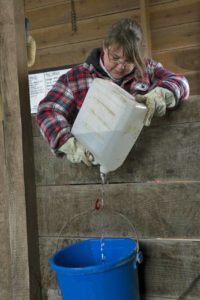 First we turn our attention to winterizing the barn and anything related to water. 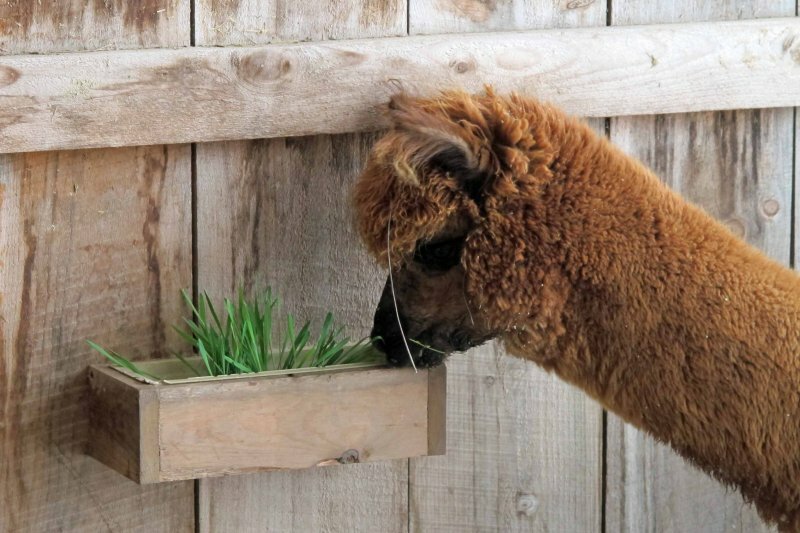 At Oak Hills Alpacas we collect rain water year round in a cistern to feed the alpacas. The cistern is located below the frost line and feeds water to the barn using a frost free pump. We remove the feeder pipe before frost and begin to rely on the 2,000 gallon tank to get us through the season. There are often warm days through the winter that melt snow on the roof, and on those days we will reconnect the feeder pipe and collect water for a day here and there. We believed this system to be bullet proof until one particularly bitter winter when the pipe inside the barn that leads to the spout froze. We now wrap that upper pipe with a heat trace line and finish the wrap with a Styrofoam pipe wrap around it. These measure have kept fresh water flowing all winter long. And that water is fed to the herd using heated water buckets. These are a terrific investment, but pricey. We did have one bucket crack inside during the off-season and took it to a plastic welder for a repair job that and it still works for us years later. No one can sleep soundly at night until that hay mow is filled with leafy green, second cut hay for the winter. We prepare for that months in advance, contacting our supplier as we don’t do hay ourselves. There is often a last minute demand, particularly if the weather has made it a tough year for hay production, so this can never be left to the last minute. And though our feed mills ensure we have feed year round, winter brings ice and treacherous conditions, making access to the barn, and lifting those heavy bags difficult once winter sets in. So we ensure our deep freeze (feed bin) is full and that we have plenty of bags on hand when winter begins. In winter we feed hay on fresh, clean snow, introducing seed that will take after frost in spring. Pastures need special attention all year round to ensure a health supply of summer forage for the herd. But as winter approaches, we pay special attention to preparing the pastures for dormancy, and to ensure they are bountiful with grass come spring. We begin with an assessment of how each of our 5 plus pastures are doing. The most heavily grazed 2-3 pastures are earmarked for special attention. Then each pasture gets its final mowing for a neat, trim look and to ensure there are no dense patches. As soon as the wet, mucky fall weather arrives, we shut the pastures off and limit the alpacas’ access to ensure they don’t do damage during the wettest weeks. When the ground freezes we open up the pastures again to allow the herd to stretch their legs. It’s at this time that we fertilize, using fertilizer produced on farm (alpaca beans) to dress those pastures we assessed as poor. Each receives a good covering of manure and then we limit access to those fields until a good snow cover has arrived. In spring, the field is ready for frost seeding and the result is a lush pasture weeks later. As autumn passes we check our fencing, ensuring both interior and exterior fencing and gates are in good condition. 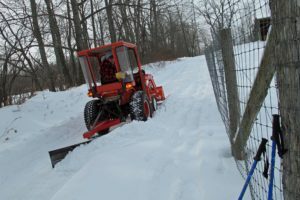 Winter snows will push fencing around if it’s not in good condition and well fastened. Gates are checked and moved to their higher hinges to allow them to swing free of snow accumulation. During the summer months the manure pile grows. We have several garden customers that come in the fall to get trailer loads of manure to prepare their beds for winter. We are sure to make those calls in early autumn so we can plan for their visits during those rare dry weeks, making it easier to load the manure onto their trailers. When that is done, we plan to get the bucket off the tractor for winter. The tractor has been serviced to ensure it is ready for winter snow. This brings me to readying the snow removal equipment. The lawn mower comes off the tractor, and the snow plow goes on. All equipment, including the tractor and ATV, get serviced to ensure no down time on those snowy days where you have to get out of the driveway and to the barn. We have had to use the tractor to pull out farm visitors. And there are icy days you rely on the ATV to get you safely to the barn and back. With all of the equipment and the barn ready for winter, we plan for the bitter winter days ahead that we know are bound to come. Our barn floor is lined with chips and dust. We do not use bedding material with the exception of the one or two deeply cold nights that happen each winter. We find that the alpacas will poop on the straw and lay on the gravel. So we get our hands on 2 bales of straw that we reserve to spread during those deep freezes. And how do we prepare the herd? To eliminate any uncertainty, we run each of our bred girls through a final spit check. While we would not rebreed at this late date, it gives us a good sense of who has maintained their pregnancy so we can give accurate guarantees to any clients who might buy our bred girls over the winter months. 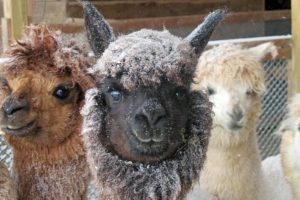 The alpacas are well insulated and more ready for winter than their humans. As winter approaches, our regular herd health checks become even more thorough to ensure nothing unforeseen needs attention during the winter months when every aspect of farming is just that little bit more difficult. 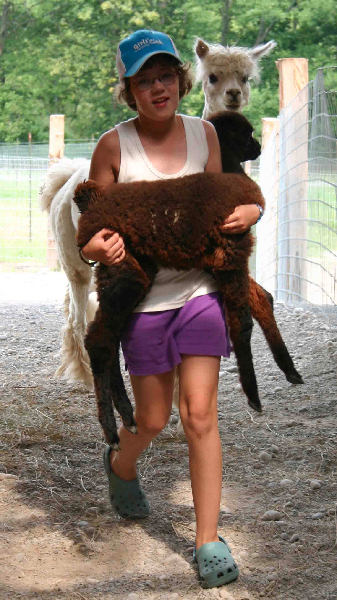 We weigh each alpaca and record a body score. This gives us a baseline weight going into the winter in case anyone falls ill and we suspect weight loss. At this time we assess their nutritional needs going into winter so we can ensure they are getting the optimal amount of feed for their body condition. We trim any teeth and toes that need attention, though this is becoming more of a rarity in today’s herd. We take a moment to give each a fibre trimming, particularly around the head, as many of our animals make their way to the spring show – we pay special attention to their look. To be ready for any emergency we keep cria coats are on hand year round, but during the winter months we ensure we have a couple for adults as well. The truth is, the alpacas are already prepared for winter with their lush fibre that insulates. All they really need is adequate shelter and feed. No heroic measures. But we do pay attention on the most bitter cold days to see if anyone in the barn is feeling the cold and needs a warm coat to get them through. We have found the pet stores and tack shops in spring to be a good source of “cria coats” on clearance. Search the dog coats and pony blankets in various sizes. Winter arrives. We’ve done all this work and find ourselves well prepared. Snow blankets everything and the herd is humming away in the barn, warm and cozy. 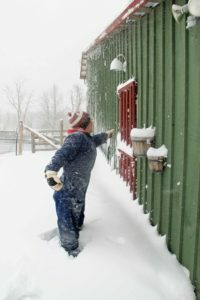 How do we fill our time during the winter months on the farm? Daily chores continue, but in a much more compressed manner. I will often find myself doing 10 other things when I am down at the barn doing chores in warm weather. But in that bitter cold of winter, chores are short, and you stick to the necessities. Unique to winter is how we feed hay. Once a blanket of snow covers the pastures, we feed hay on top of the clean snow. This accomplishes many things. First, the alpacas spend much more time out in the sunshine, absorbing much needed Vitamin D. Second, the seed in the hay makes it way through the snow in spring, frost seeding the pastures. When the snow arrives we find ways to have fun on the farm. Where I find our activities change are in the farm office. In winter time, the three of us sit by the fire and talk. This is when our planning activities take place. We love what we do so much on the farm, that these conversations infiltrate every meal and every relaxing moment. We are inside together keeping warm, and we use that time to make our exciting plans for coming year. We plan breedings for the coming year. Our daughter scans the internet and talks to other farms about the stock they have available and creates our wish list of acquisitions for next year. We decide which alpacas will be traveling to the show in the spring. And I dig deep into marketing during the winter and developing our customer base. The biggest surprise that winter brings to our farm is the parade of customers. We had always expected the farm to be busiest in the warm weather months. 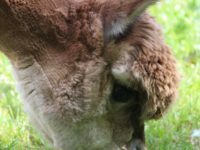 But it should be no surprise that alpacas farmers, just like us, start shopping for livestock in the winter, and most make their decisions in January. 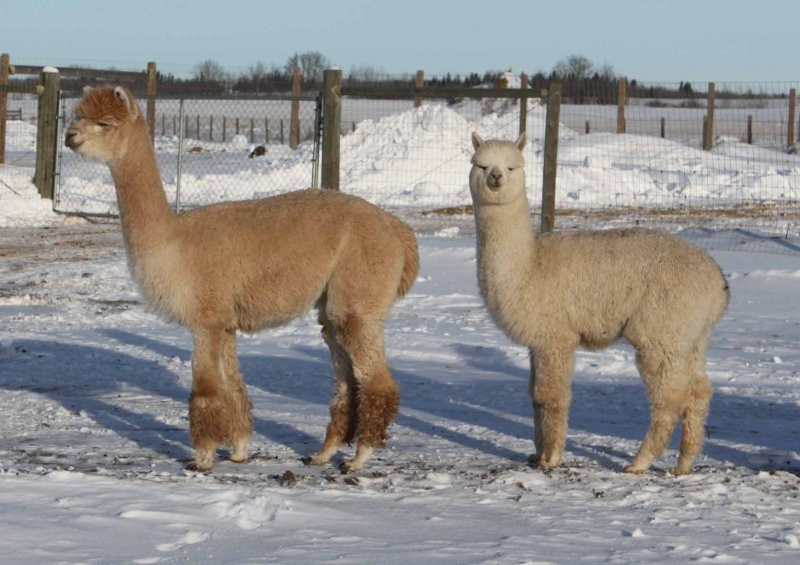 We are never get tired of welcoming the new year and welcoming newcomers to alpaca farming. 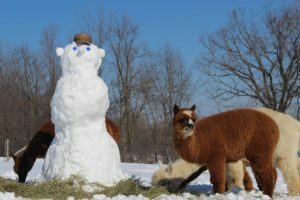 If becoming an alpaca farmer or farm family is your New Year’s Resolution, be sure to visit an alpaca farm this winter! Originally published in the December 2017 issue of Camelid Quarterly. A special thanks to the editors for their permission to reprint.